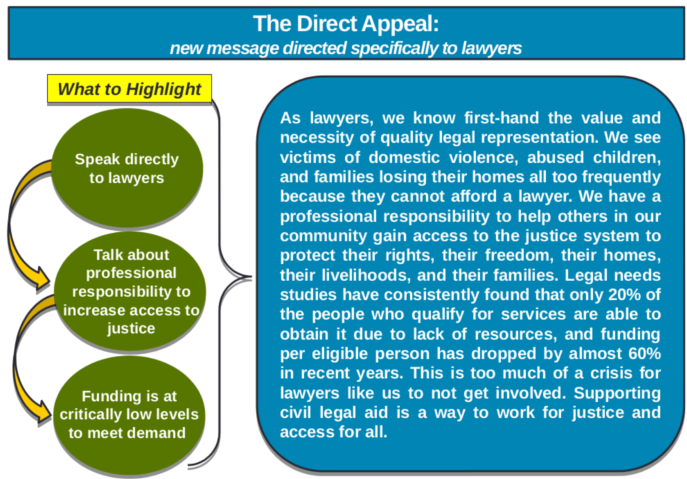 Civil legal aid message for lawyers. Developed by bipartisan pollsters, 2014. As lawyers, we know first-hand the value and necessity of quality legal representation. We see victims of domestic violence, abused children, and families losing their homes all too frequently because they cannot afford a lawyer. We have a professional responsibility to help others in our community gain access to the justice system to protect their rights, their freedom, their homes, their livelihoods, and their families. Legal needs studies have consistently found that only 20% of the people who qualify for services are able to obtain it due to lack of resources, and funding per eligible person has dropped by almost 60% in recent years. This is too much of a crisis for lawyers like us to not get involved. Supporting civil legal aid is a way to work for justice and access for all. This is a summary of highlights from 2014 opinion research among lawyers on expanding Civil Legal Aid. The research was conducted by Lake Research Partners and The Tarrance Group. The research included one‐on-one interviews and a subsequent online nationwide survey among lawyers. This research is an expansion on research conducted in 2013 by Lake Research Partners and the Tarrance Group among likely voters. Following are a few highlights. You can also download the full presentation (35-page PDF of Powerpoint presentation; Warning, big file: 38MB). Unlike voters, lawyers are almost universally familiar with Civil Legal Aid. Fully 91% are familiar with the term and three-quarters are favorable toward the program. In comparison, 36% of voters had never heard of or had no opinion of Civil Legal Aid in the 2013 research. Lawyers also have solidly positive impressions of pro bono and legal aid lawyers. While fewer efforts are needed to introduce Civil Legal Aid to lawyers, some lawyers, especially those who are existing donors, have ingrained impressions of what Civil Legal Aid is as a program. This proves the successes of previous messaging efforts, but opens up the potential for resistance to broadening the definition. Overall, however, lawyers are very receptive to a broader definition of Civil Legal Aid. Most lawyers’ impressions of Civil Legal Aid are established in law school when they are first introduced to the program. Reaching out early to lawyers during this formative phase is key to establishing long­‐lasting relationships. Like voters, lawyers believe one of the key values associated with Civil Legal Aid is fairness (30%). They also believe access (31%) is a primary value (something that was not included in the voter research). Additionally, lawyers referenced a professional responsibility to get involved in Civil Legal Aid to provide more access to individuals. Throughout the one-­on-‐one interviews, lawyers voiced frustration about problems with access to justice and acknowledged the importance of lawyers’ role in helping people. Programs should keep these values in mind when communicating with lawyers. Lawyers are more likely than voters to support increasing government funding for civil legal aid. Current and previous donors and volunteers are very passionate about civil legal aid. The broadening of the definition and new messaging strategy will not deter them from being involved. To learn more, download the full presentation (35-page PDF of Powerpoint presentation; Warning, big file: 38MB).